On February 12, 1809, Abraham Lincoln was born to Thomas and Nancy in a small log cabin on the Sinking Spring Farm just south of Hodgen’s Mill, Kentucky (now called Hodgenville). Abraham was named after his grandfather. He had an older sister, Sarah. Thomas had purchased the farm in December 1808, for $200 for 300 acres of land. 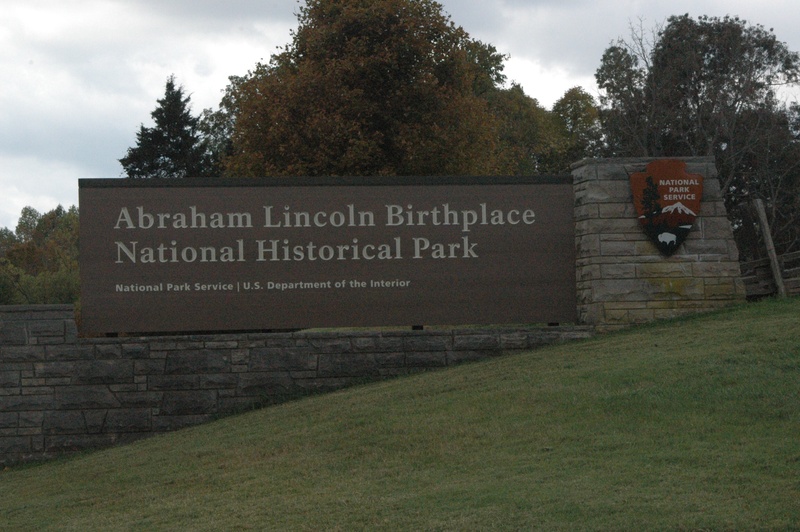 The Lincoln’s moved to Knob Creek area 2 years after his birth, due to a land dispute on the Sinking Spring Farm. 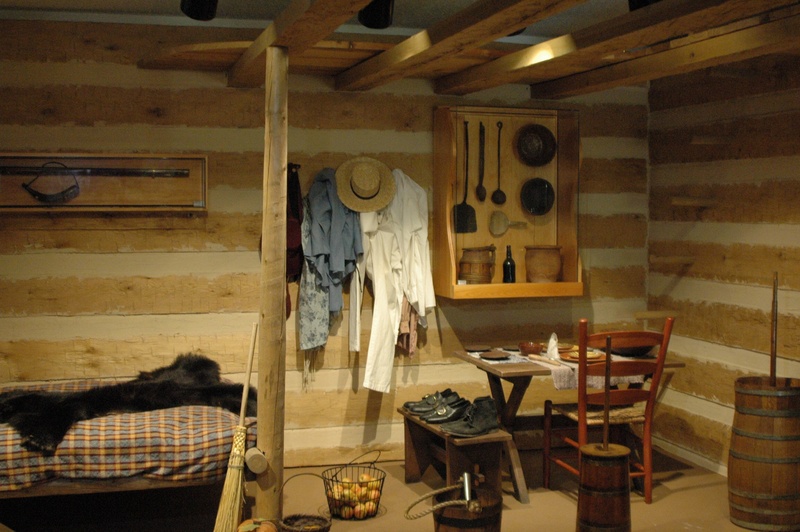 In 1907, an effort began to preserve Lincoln’s birthplace, and what was thought was the actual cabin that he was born in. 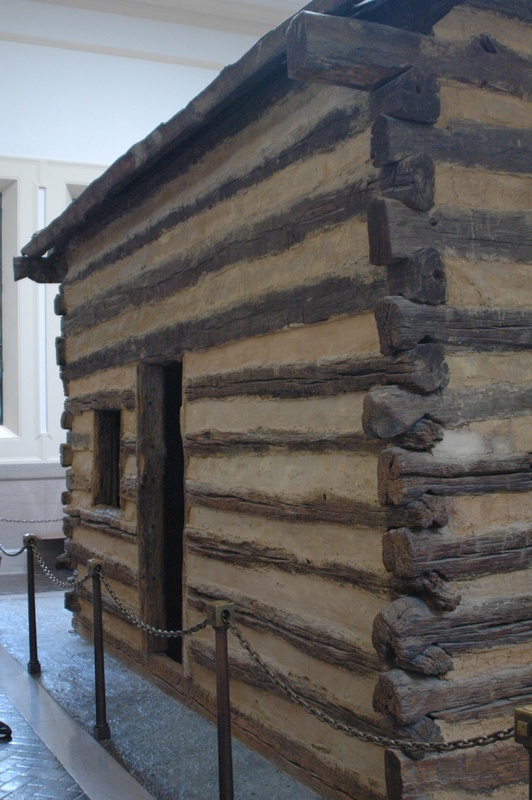 Over 100,000 citizens donated $350,000 to build a memorial for Lincoln, and his log cabin. President Theodore Roosevelt laid the cornerstone in 1909. In 1911, President William Howard Taft dedicated the memorial. It was almost 50 years later, when they determined it was not the exact cabin, but is considered symbolic of the cabin. There are 56 steps on the memorial, one for each year of Lincoln’s life. 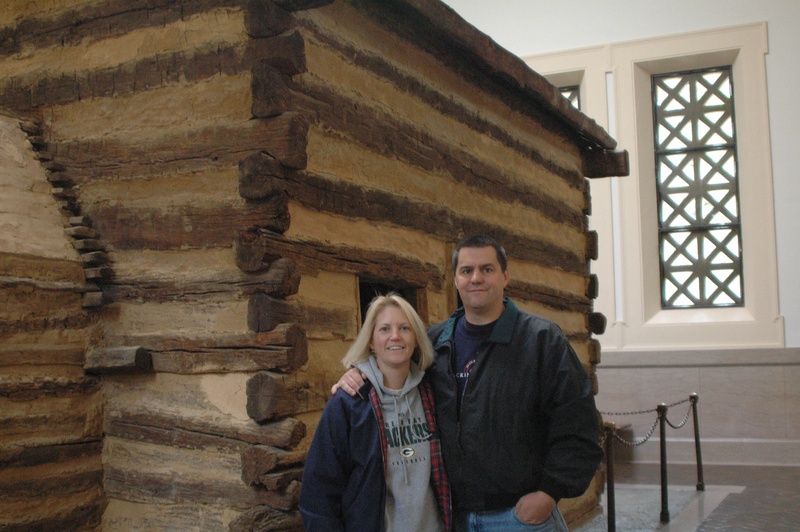 Inside the memorial is the log cabin that is symbolic of the period. 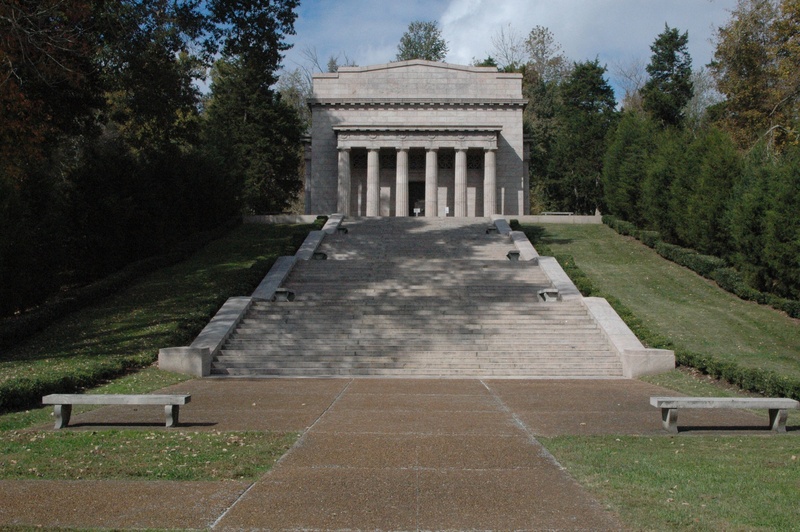 It is still the original cabin that was placed in the memorial in 1907. There is nothing inside this cabin, and nothing else inside the memorial. 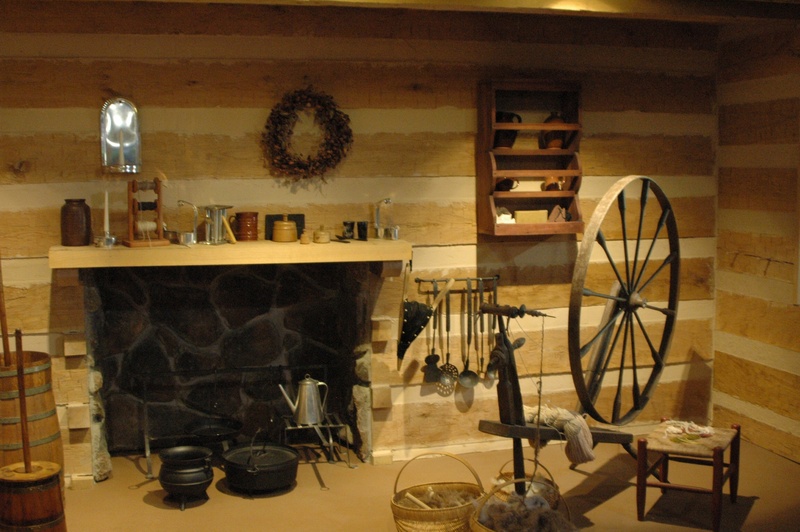 The visitor center of the park has a nice 15 minute video on Lincoln’s time at this farm, along with what they believe the inside of the cabin would have looked like. 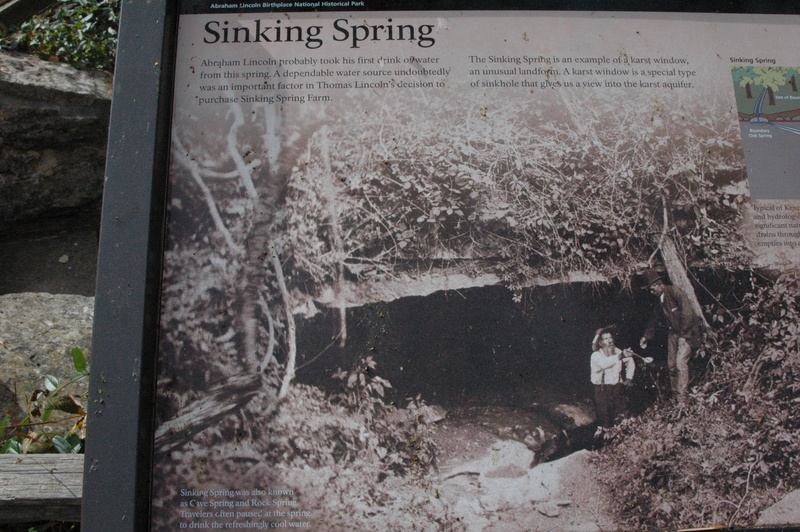 On the grounds you can still see the spring that gave the farm the Sinking Spring name. 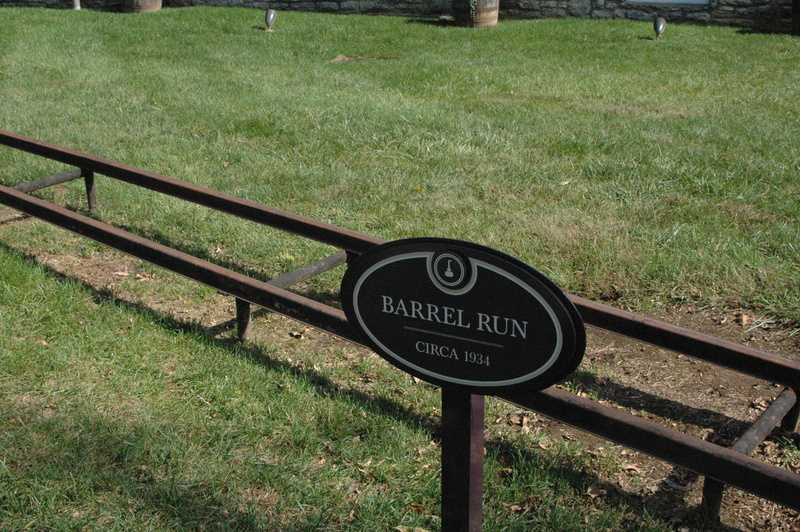 In 1811, the Lincoln’s moved 10 miles northeast to a farm on Knob Creek. 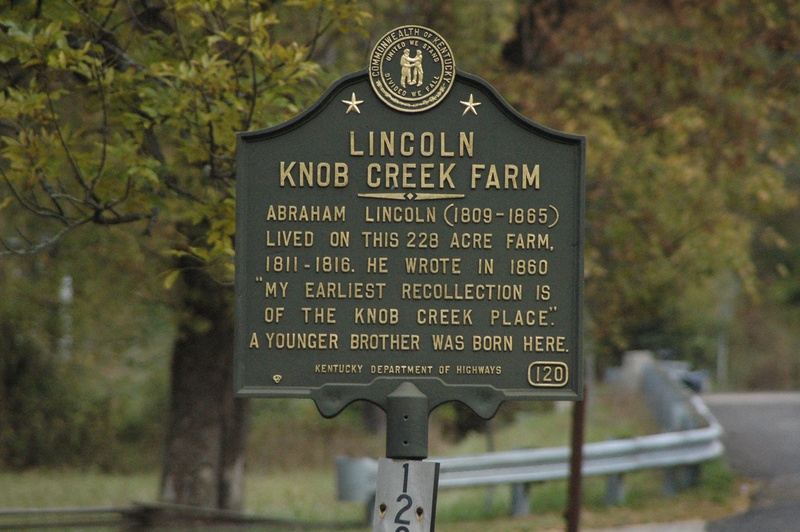 Lincoln stated his earliest recollections of his life were at the Knob Creek farm, where he helped his parents farm many crops on the fertile soil. 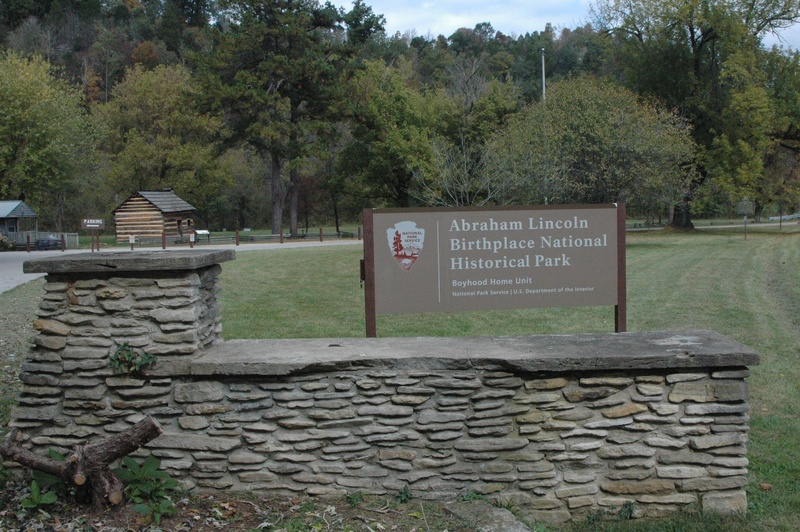 There are no original buildings remaining from Lincoln’s time on this property. The land at Knob Creek is a beautiful area, and the National Park Service has left it undeveloped. There is a walking trail that goes around the park, so you can walk and hike in the same area that Lincoln did when he was a boy. 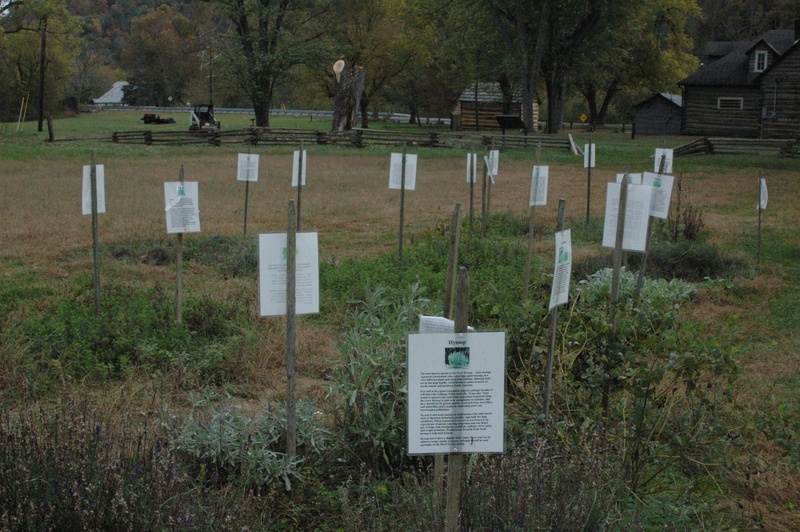 The park service has planted a small garden to represent all the crops that would have been grown on the land by the Lincoln family. 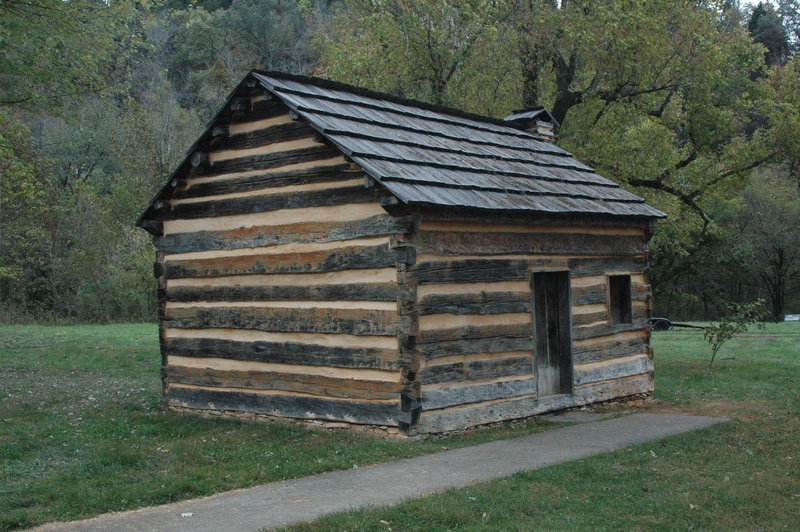 The park service also obtained and rebuilt the one room log cabin owned by the family of Austin Gollaher. Austin was Abraham’s childhood friend. The boys were out playing near a creek one day and Lincoln fell in and almost drowned. It was Austin that had saved is life. Imagine how different our country would be today, if Lincoln was not the 16th President. In 1816, Lincoln’s father lost his court battle over the Sinking Spring Farm. In addition, the family was being evicted from the Knob Creek farm over a land dispute. In December of 1816, the Lincoln family packed up and moved to Indiana. Lincoln would never return to the state of Kentucky. 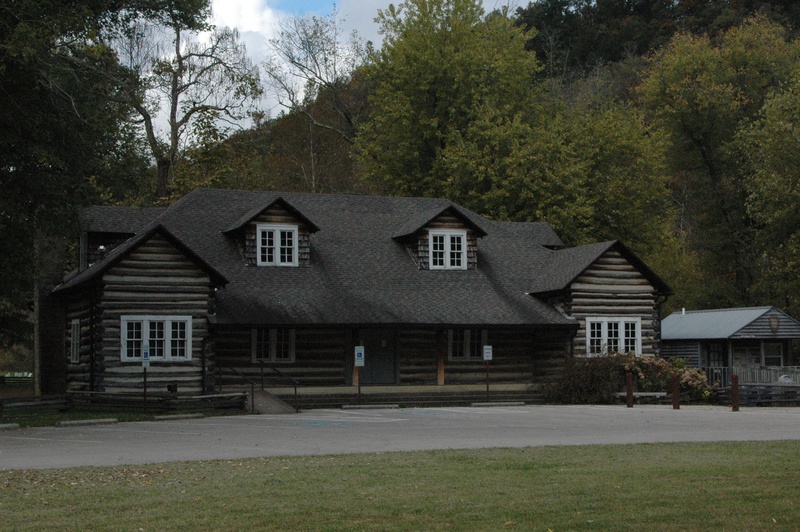 In 1928, Hattie and Chester Howard purchased the Knob Creek farm, and they built the Lincoln Tavern on the site to both honor Lincoln and capitalize on tourism in the area. 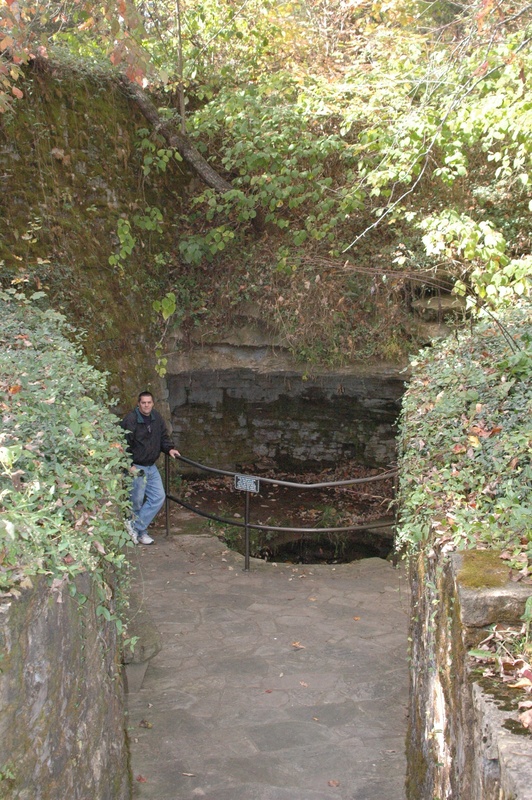 The park service took over the site on 2001. The tavern building is not open to the public, and the park service has not decided what to do with it. Fort Knox is an actual city in Kentucky, and covers three different counties. The military base was established in April of 1918, as the military was in need of new bases for training soldiers in WWI. When WWI ended in November of 1918, the base was used as an area to bring the returning troops home to, and then as a peacetime training facility for the Army. In WWII, in addition to training soldiers, it was used as a POW camp. Since then, it has undergone different assignments, but continues to be an active base for the Army, and in training soldiers. The most famous building on Fort Knox is the United States Bullion Depository. We were surprised by how close to the highway the building is. The building is not open to the public, and I took the photo was Dan was driving down the highway. The building is more commonly referred to as the “gold vault”, as it houses the largest portion of the United States gold reserve. The first gold was brought to the building in 1937, and protected by the 7th Cavalry Brigade. In addition to gold, during WWII the building housed the Declaration of Independence, the United State Constitution, Lincoln’s Gettysburg Address, three volumes of the Gutenberg Bible and the Magna Carta. The James Bond movie Goldfinger was partially filmed at Fort Knox, as Bond prevented Goldfinger from destroying the gold depository. The most recent movie filmed at Fort Knox was Stripes, with Bill Murray. In the movie, the base was called Fort Arnold. The city scenes in the movie were filmed in Louisville. 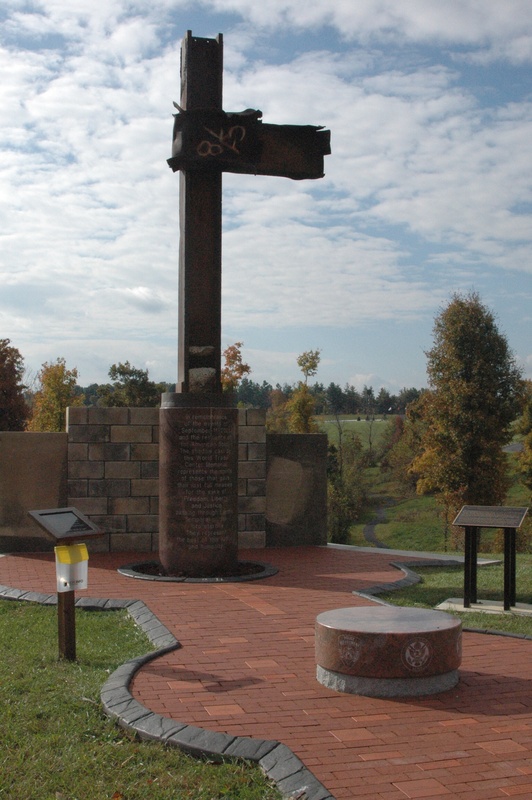 After Fort Knox, we stopped at the Kentucky Veteran’s Cemetery in Radcliff, KY to see The Kentucky September 11th Memorial. 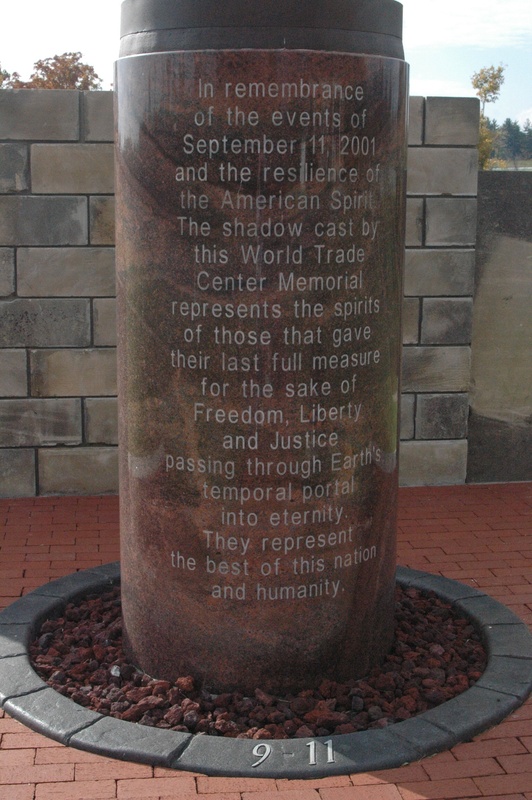 The memorial was constructed from a piece of steel from the North Tower of the World Trade Center. The wall behind the steel beam is made of bricks recovered from the Pentagon. For me and my family personally, September 11 was a reminder that life is fleeting, impermanent, and uncertain. Therefore, we must make use of every moment and nurture it with affection, tenderness, beauty, creativity, and laughter. We have decided to take a break from distillery tours, since some others venues have now opened back up. 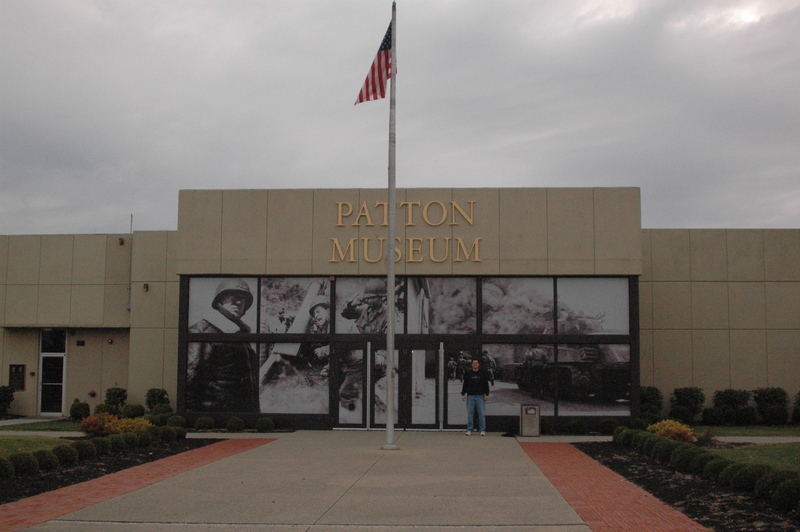 Thursday we drove up to Fort Knox, Kentucky to see the General George Patton Museum of Leadership (cost: free). 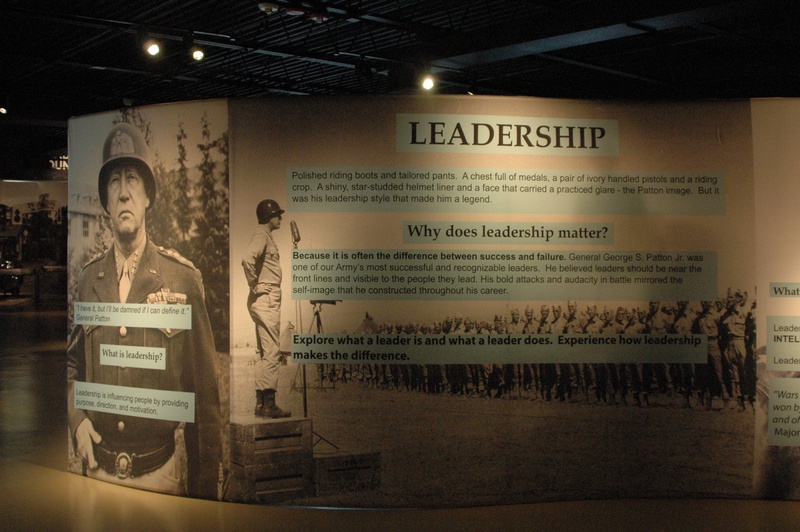 This is the Army’s only museum dedicated to the history of Army leadership at all levels. 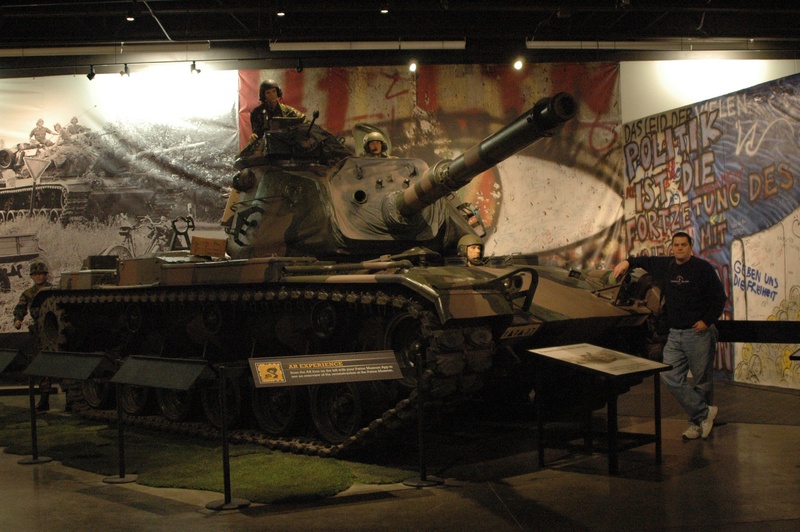 It was first opened in 1949 as the Patton Museum of Cavalry and Armor and was in operation until 2010. 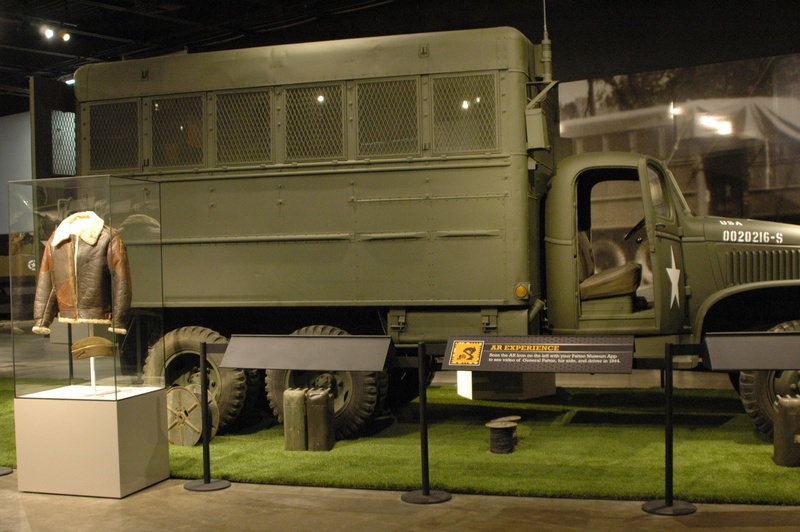 Many of the tanks have since been moved to Georgia, and the museum is currently undergoing a transformation with the new leadership format. There are many exhibits that are still under construction. Probably by next year, it will be completed. Regardless, it was well worth a visit. 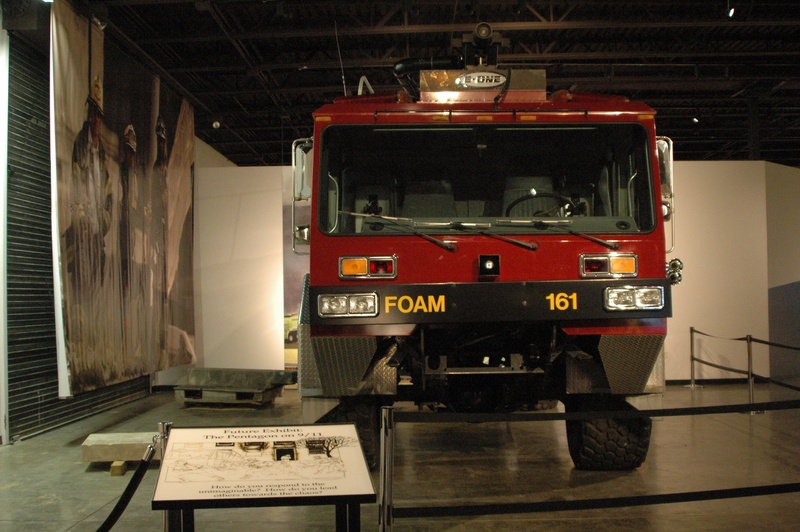 The museum covers Army history from 1775 right up to the Afghanistan and Iraq wars. It is also the first museum we have visited that encourages you to bring in your smart phone or tablet device. They have free Wi-Fi, and encourage you to download the museums app. There are multiple spots where you can scan a code into the smart-phone, and it will provide additional information and videos on the display that is in front of you. 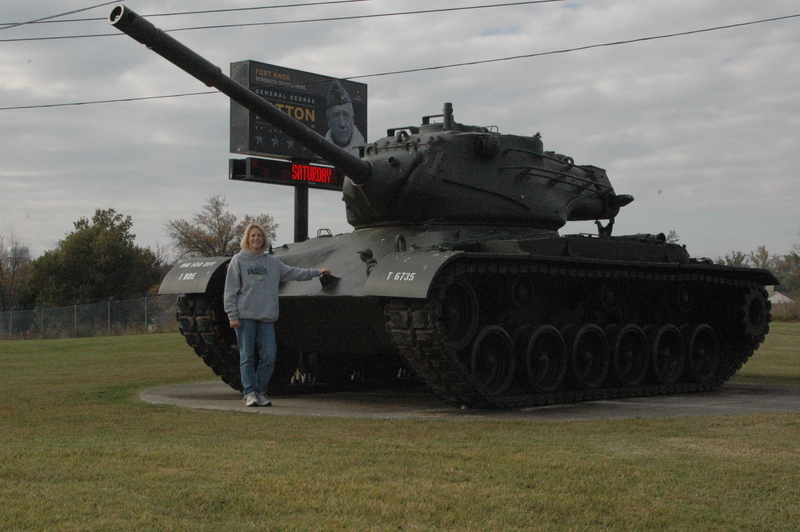 They do have a few tanks remaining outside the museum. 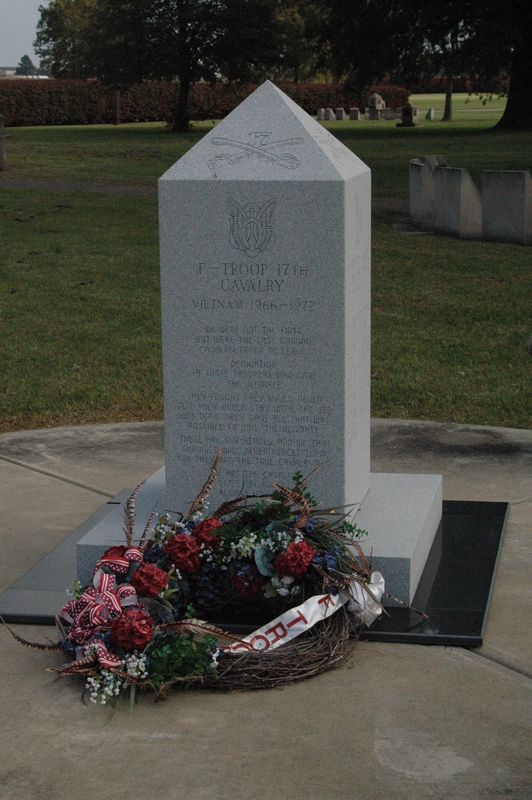 They also have Armor Memorial Park outside, and this monument caught my attention, as it had a wreath by it. It was honoring the F Force troop in Vietnam. My two older brothers served in Vietnam, thank you Greg and Jerry. And thank you to all our veterans. General George S. Patton, Jr. (born 1885), came from a military family, and attended both the Virginia Military Institute and West Point. He worked his way up through the ranks and had 438,000 GI’s under his command in the Third Army in WWII. 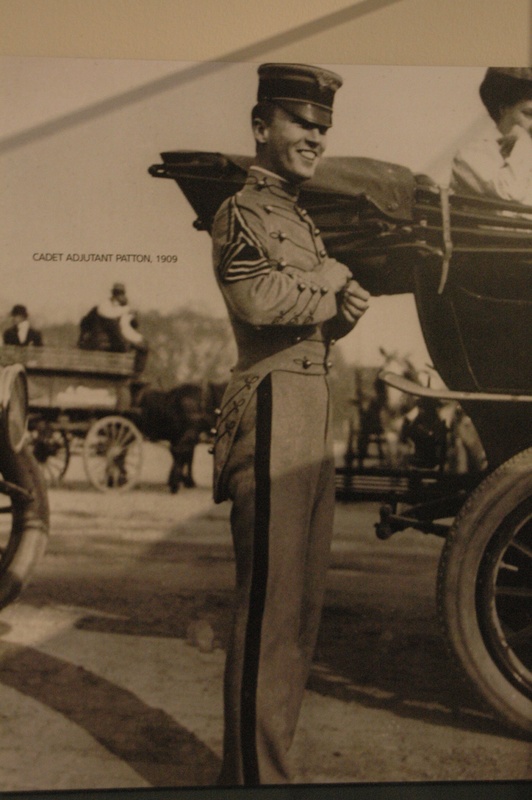 Patton, as a Lieutenant, participated in the pentathlon in Olympics in Stockholm, Sweden in 1912. 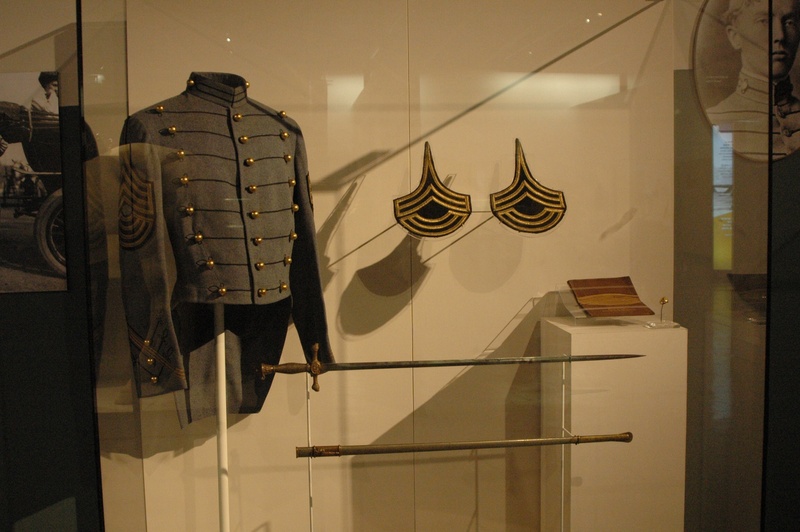 After the Olympics, he studied with the French Cavalry and is credited with designing the M1913 cavalry saber. The design became known as the “Patton Saber” and was effective at piercing an opponent. It was the last saber issued by the Army. 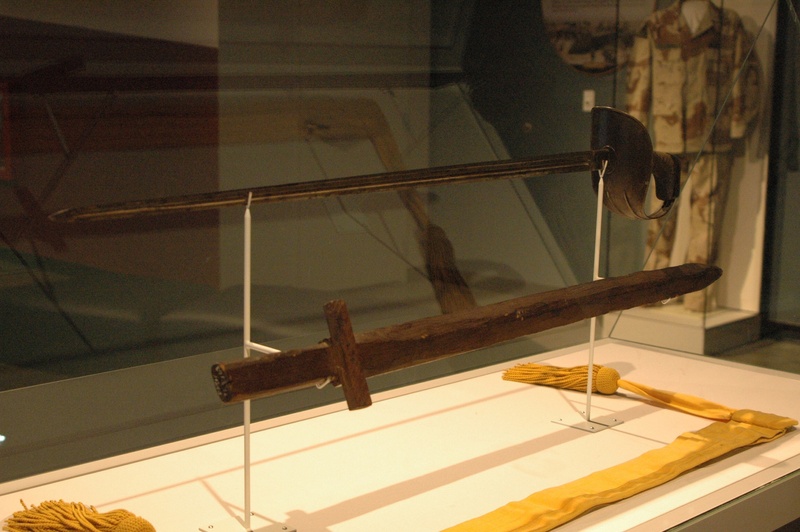 Below is a photo of the saber, along with a toy wooden saber that Patton played with as a child. 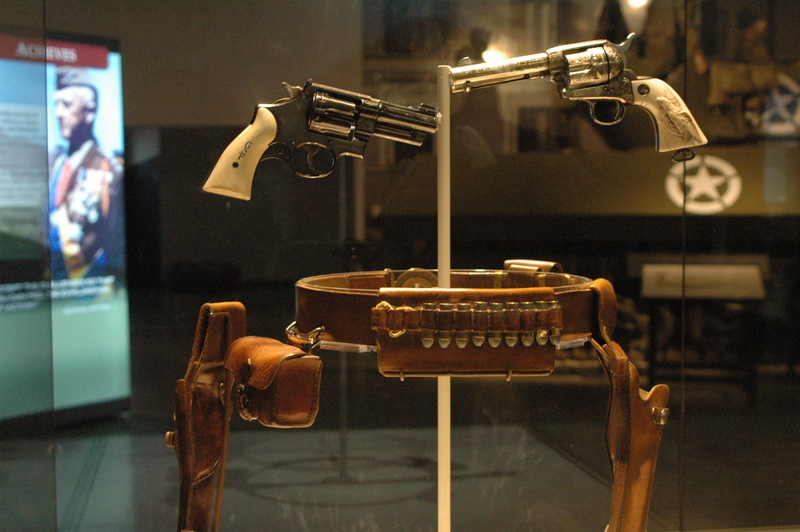 Patton purchased a Colt 45 revolver in 1916 in Texas, and carried it with him until his death in 1945. This revolver was designed in 1872, and was the standard issue service revolver used by the Army until 1892.
Who knew Patton was an RV’er??!! 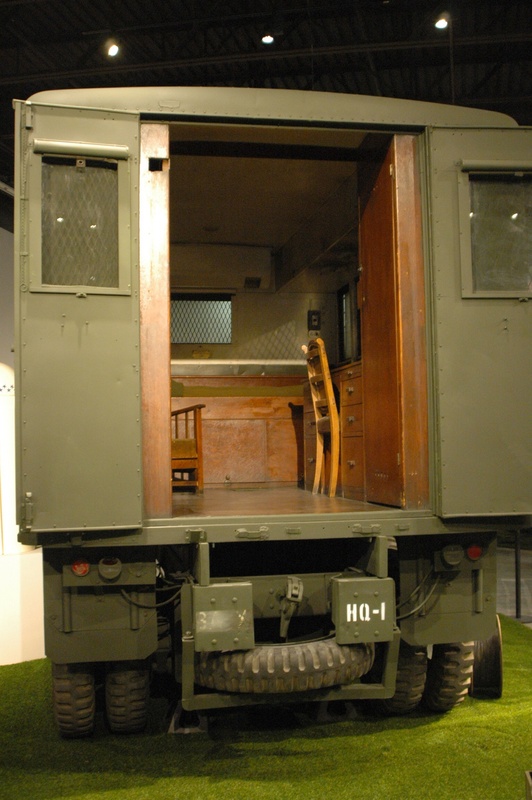 This was his quarters that he lived in when he was out with the troops. Patton was loved by his soldiers because he stayed with them, unlike other Generals that would stay in hotels. Patton believed an effective leader needs to be out front with his soldiers. 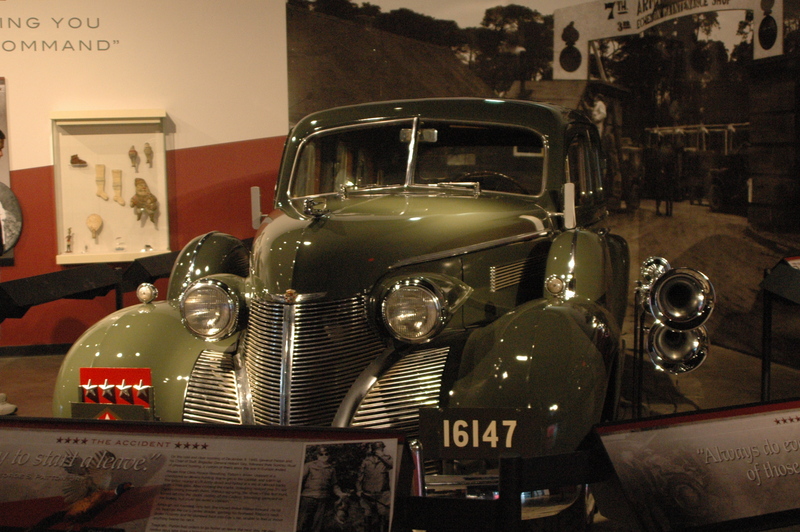 Below is a photo of the restored 1938 Cadillac Limousine, Series 75, that was given to him in 1945 by his troops after it was seized from the Nazi’s. On Sunday, December 9, 1945, General Patton was riding in the back seat, heading out for a pheasant hunt when his driver, a private first class struck a truck that turned in front of them. 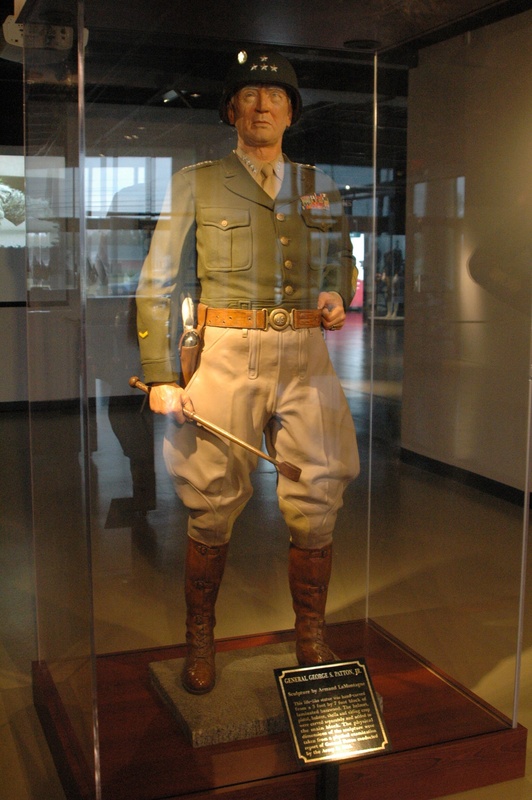 Patton was thrown forward and struck his head on the glass divider, which fractured his neck and paralyzed him. Patton was hospitalized, and ordered that no investigation be made of the accident, as he did not want any discipline to occur of either driver. The museum displays part of his hospital records. He was reported to be improving, but 12 days after the accident his vitals rapidly declined and he passed away from a pulmonary embolism (blood clot in his lung). Patton was only 60 years old when he passed away. 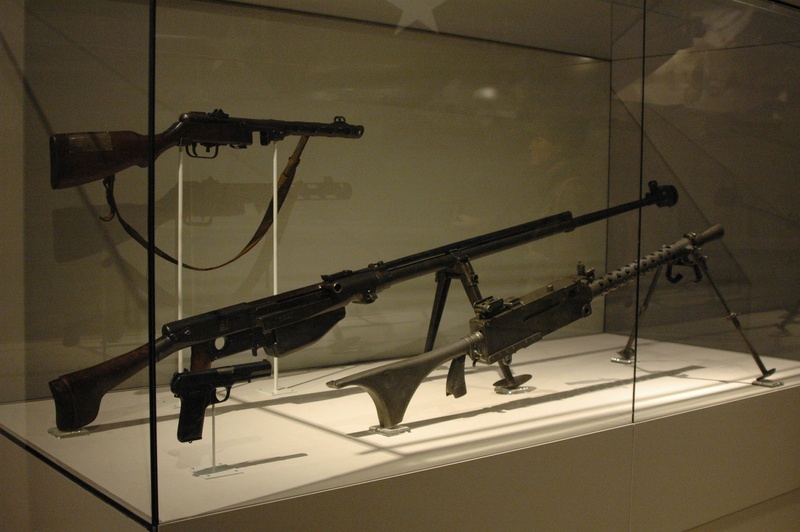 The museum has a large collection of weapons. Coach T your dad could add this one to his collection! 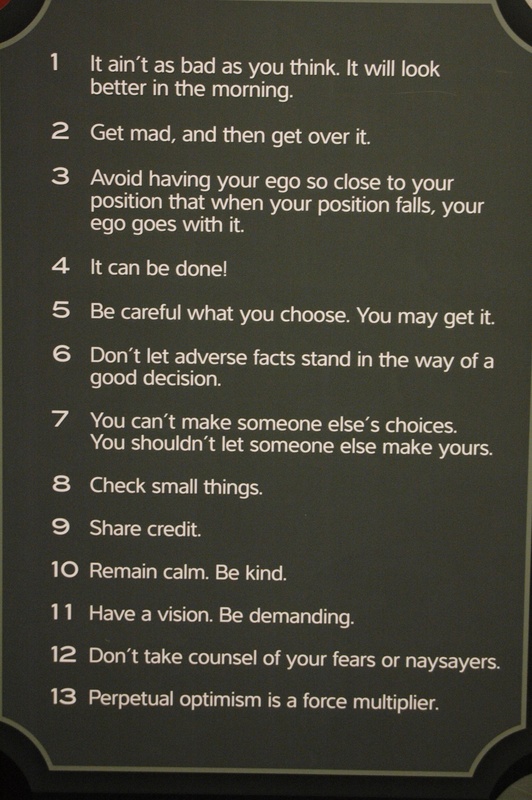 They also had a small recognition of General Colin Powell, and listed his 13 rules to live by. I think we should all follow these (you may need to double-click on this photo to read all of them). 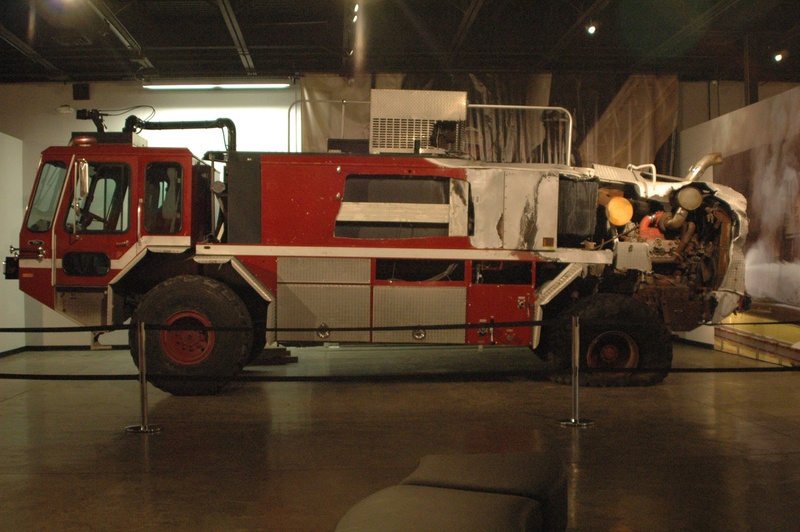 The newest exhibit at the museum, which arrived on September 11, 2013 and is still under construction, is a fire truck from the US Army that was on duty at the Pentagon on 9/11/2001. 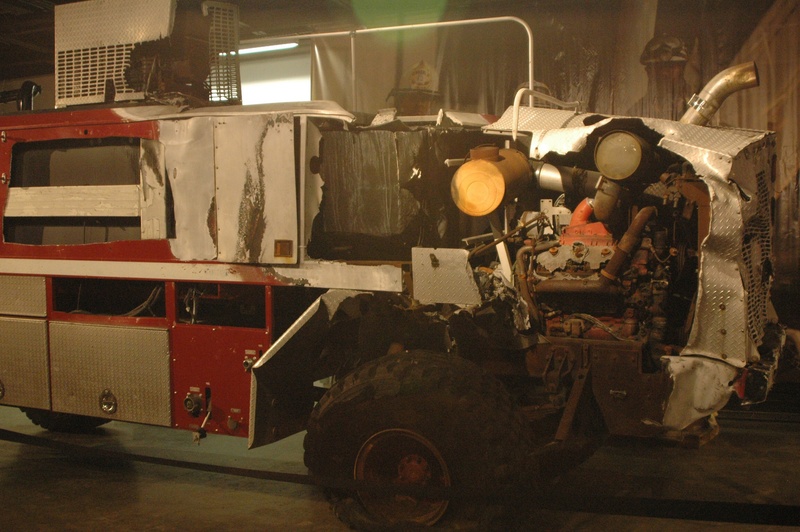 The truck was damaged during the attack on the Pentagon. We will definitely return to this museum, as it is only going to improve as it develops more exhibits. Only 1 more day to go and it’s the weekend for us!!! The internet works better when 200 campers leave. 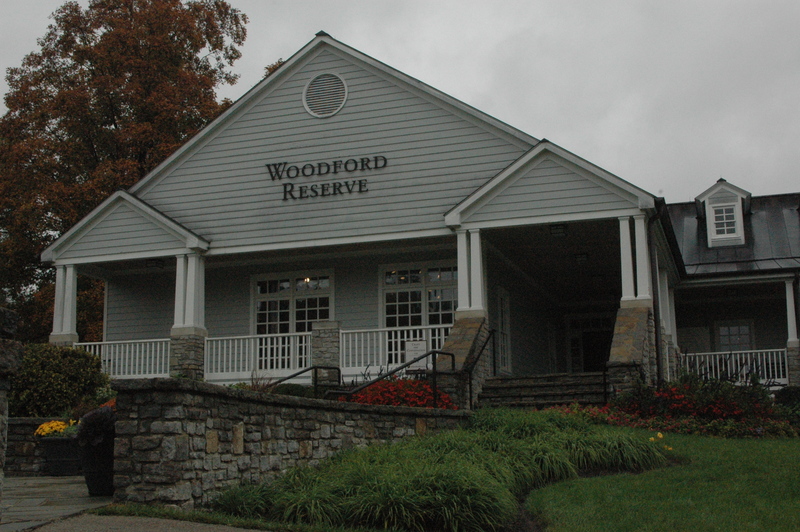 So to continue on with last Thursday’s journey, we went to Woodford Reserve Distillery in Versailles, KY for their tour (cost $7.00). 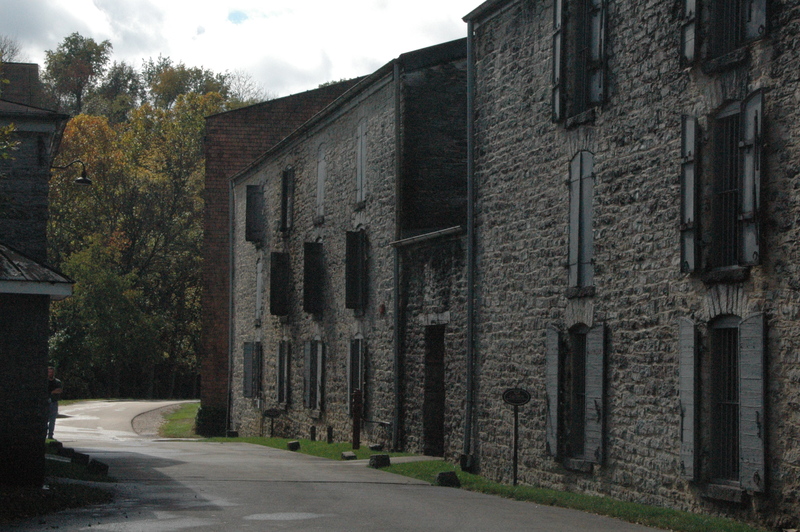 It was a beautiful drive thru horse farms to get to the distillery, which is also a National Historic Landmark. 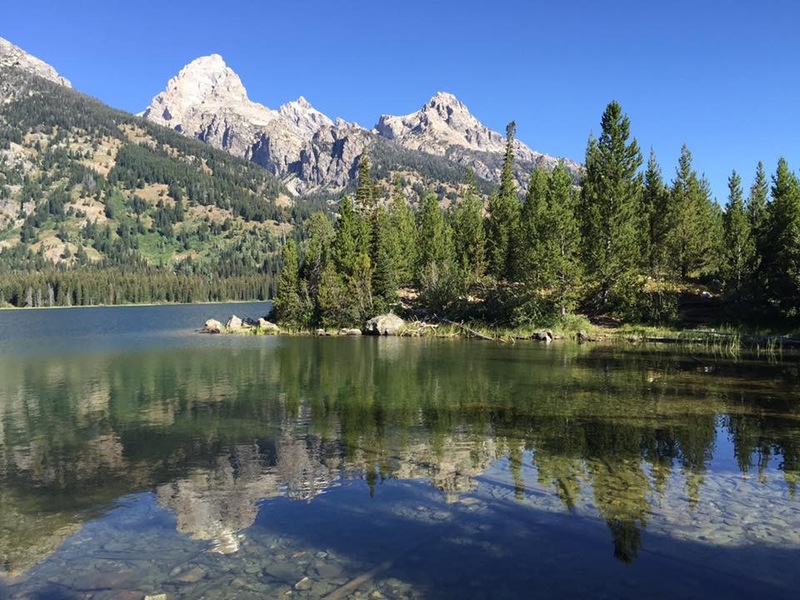 The tour was excellent, as we were able to see a few things we have not experienced before. One nice part of the tour was everyone was given headphones, so we could clearly hear what the tour guide was saying. He started out discussing what makes a bourbon, and the 5 sources of flavor (grains, water, yeast, copper pot distilling, and aging in barrels). 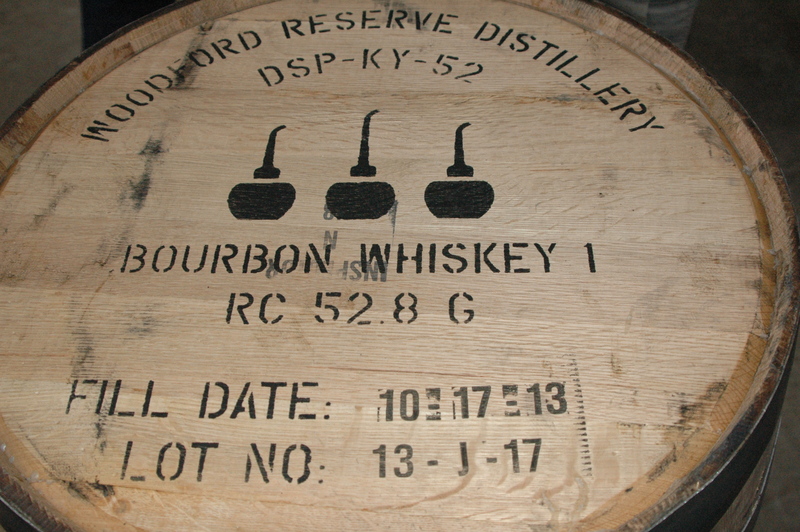 Woodford Reserve has one recipe, and one bourbon, all distilled in small batches. 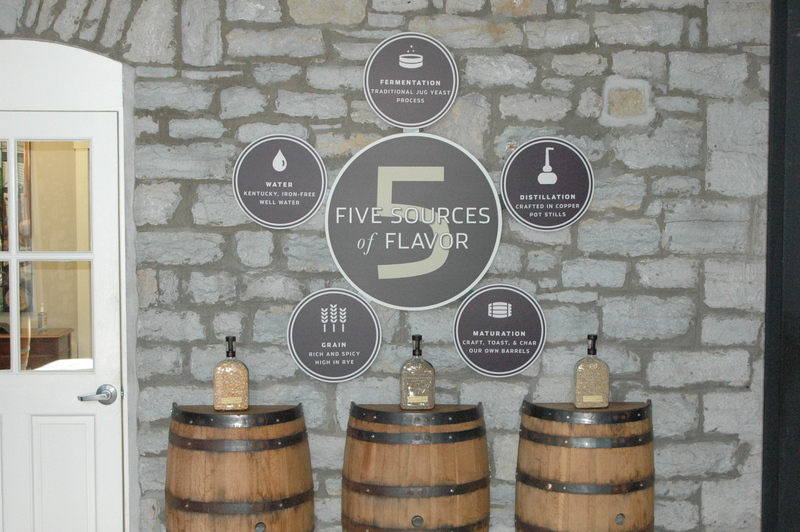 Woodford Reserve is the only distillery in Kentucky that triple distills their bourbon, which creates a smoother taste. We were able to watch an employee hand stamp all their barrels with their logo, as well as the date, as they were filling the barrels while we were there. in 6-8 years, todays barrels will be ready to drink! After the bourbon goes thru the 3 copper pot stills, it goes into a barrel. 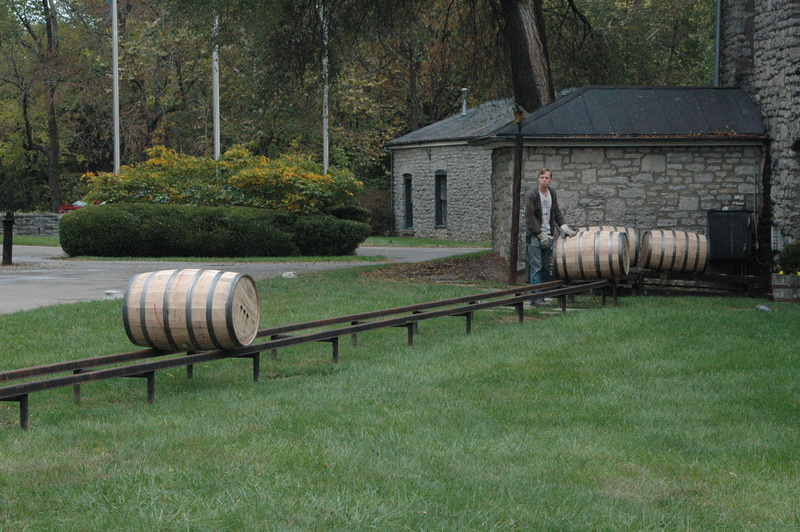 The barrels are then sent down what looks like railroad tracks, to the only surviving limestone aging warehouse in the United States. Inside the warehouse are hundreds of barrels, just waiting for the right time, usually 6-8 years. 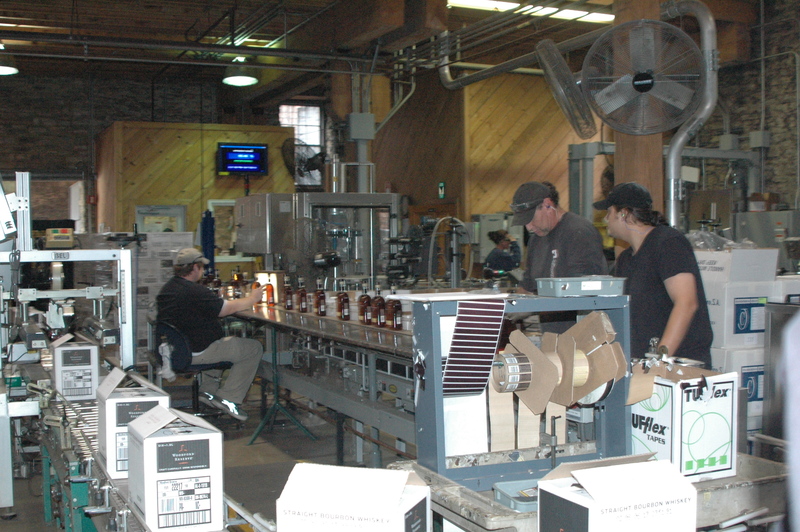 When the master distiller determines the bourbon in the barrels has reached its full maturity, those barrels are taken from the warehouse and brought into the bottling area. 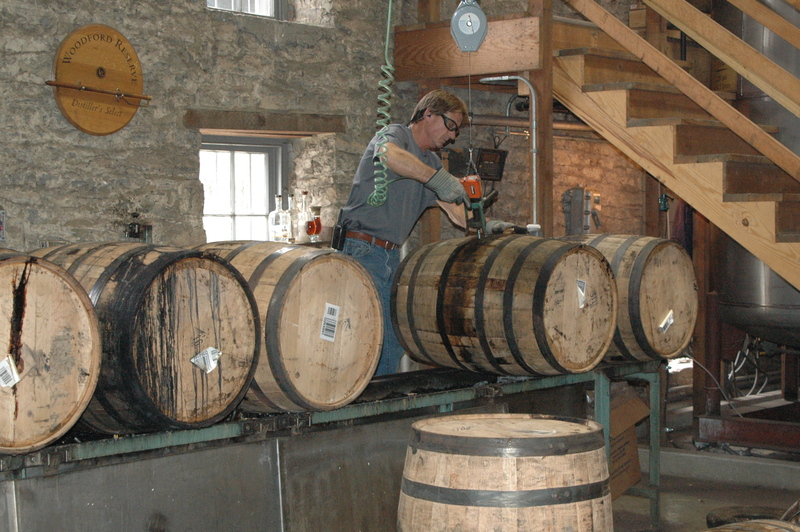 An employee uses a lift to place the barrels on a trough, and then drills out the barrel stop, rolls the barrel over, and the bourbon drains out. 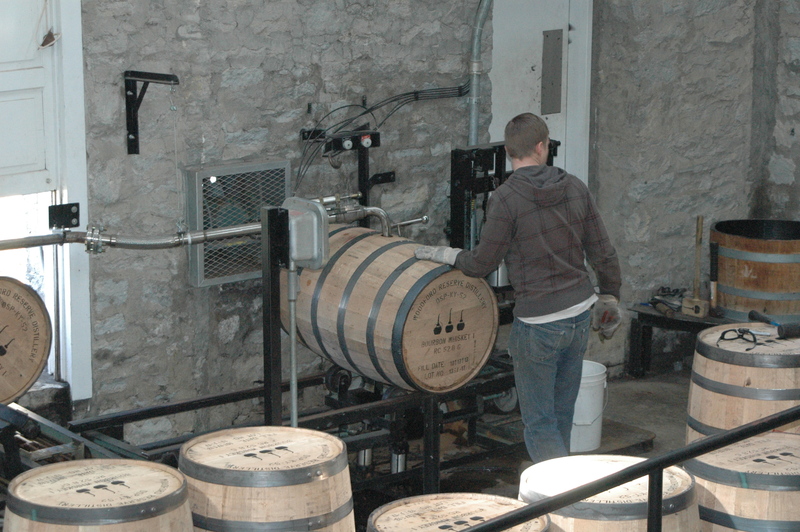 drilling out the cork – barrel is ready to bottle! 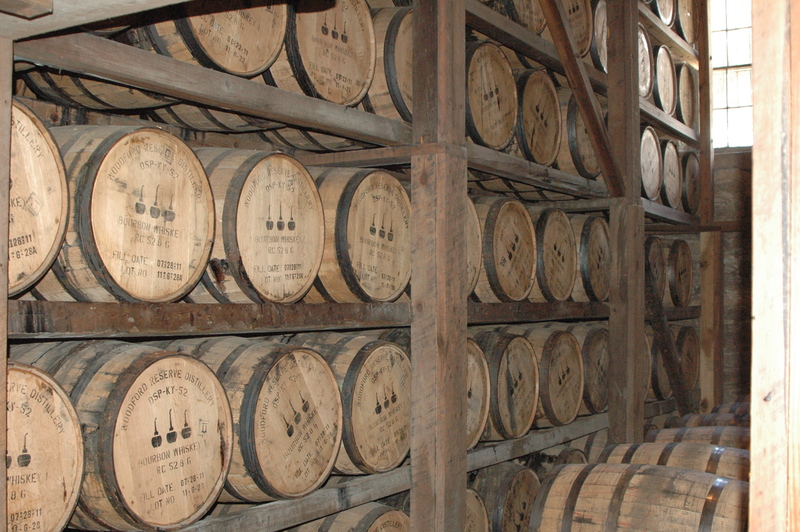 You can see the bourbon pouring out of the barrel below on the right. The bourbon then goes to these large tanks for filtering, mixing and then on to bottling. 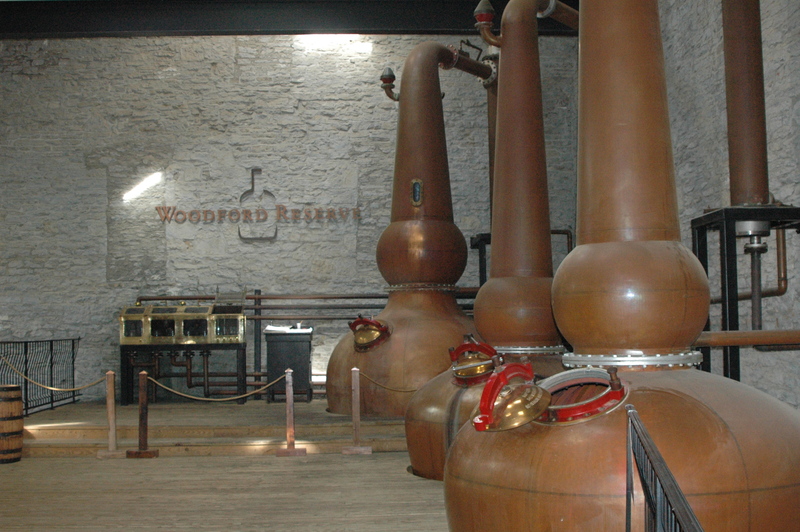 The tour was great, and we really enjoyed the Woodford Reserve bourbon. Plus, we got to keep the RV friendly acrylic glass that our sample came in! 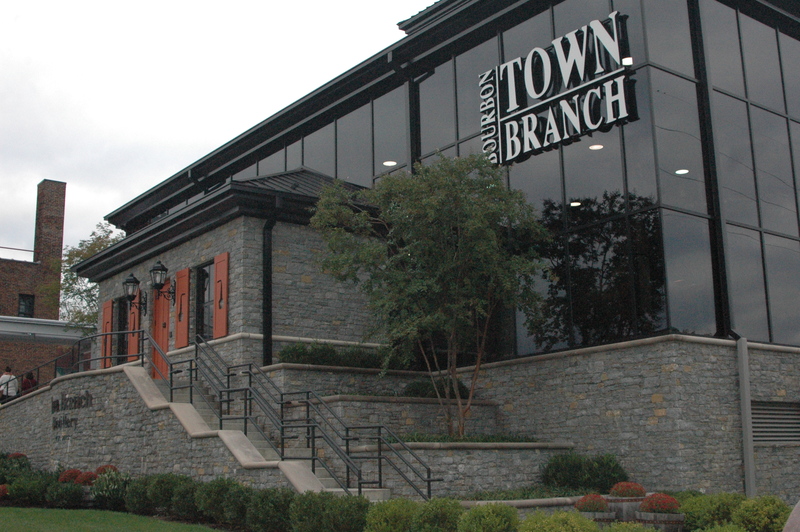 After Woodford Reserve, it was off to our final stop for the day, at the Town Branch Distillery in Lexington, KY. 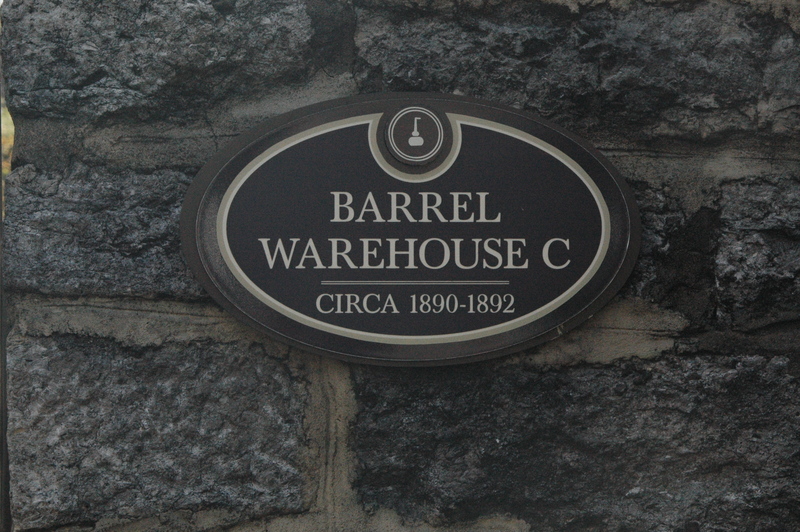 This distillery is new to the Bourbon Trail for 2013. They have both whiskey, and craft beer. 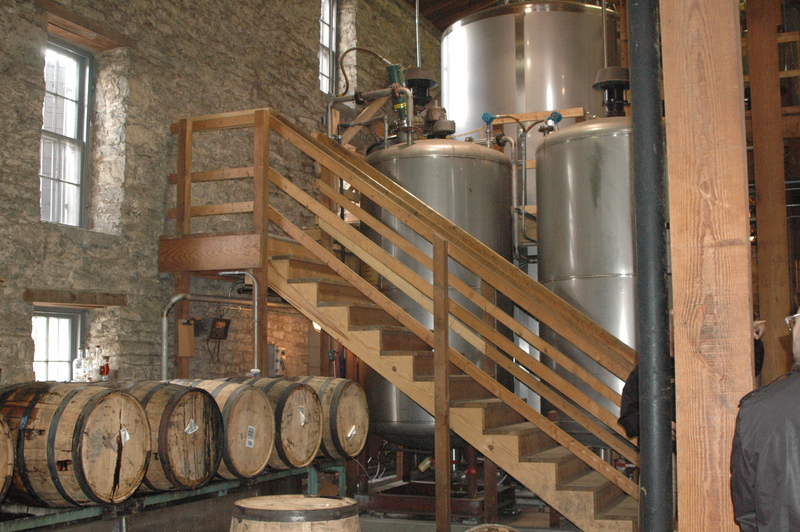 We toured both the brewery, and then the distillery, which is only operating part-time now, as it is new. 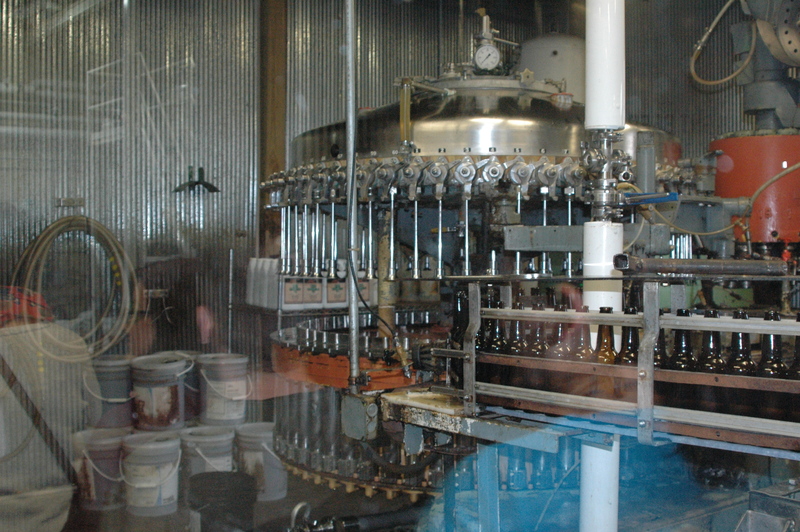 The brewery uses an old 1940’s bottling machine for their beer. It reminded me of an old episode of Laverne and Shirley. Their bourbon was okay, but they had excellent craft beer. 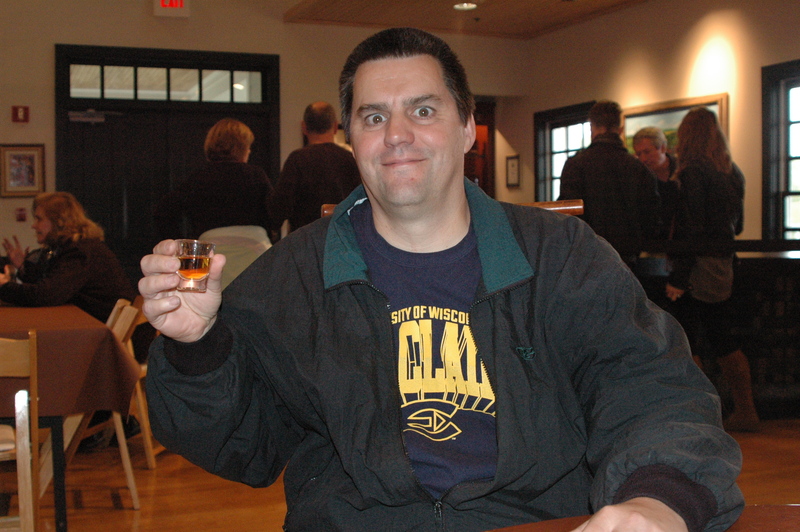 The best that we tasted was Kentucky Bourbon Barrel Ale. 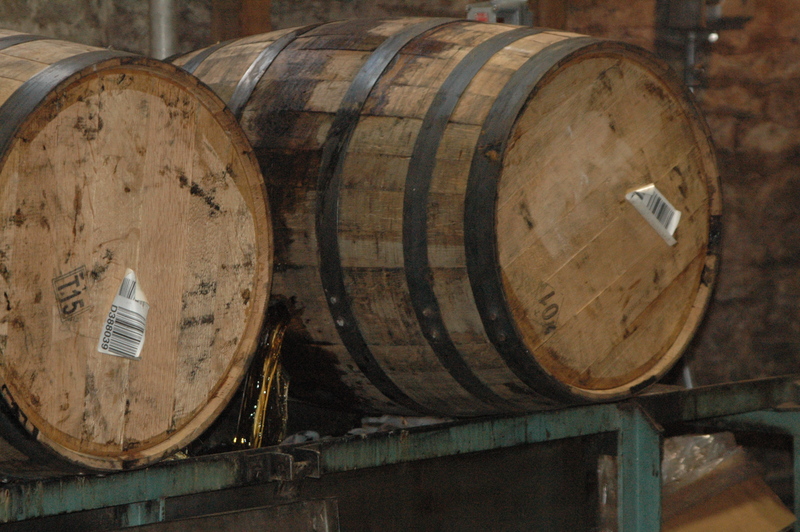 They take their Ale beer, and then put it into used bourbon barrels, for 6 weeks of aging. It was one of the best tasting beers we have ever had. They said they are now selling their beer in Ohio, Illinois, and Wisconsin. So if you have a chance to purchase their beer, I would recommend it! It comes in a 4-pack, and was a bit pricey down here at $11.99. But it was very tasty. They also have a Kolsch-style beer, regular Kentucky Ale, and a hoppy IPA. We also liked the Kolsch-style beer (can’t be called just Kolsch, as it was not made in Germany). It was a lighter style of beer. All in all, it was a good day working our way around Kentucky. Only 2 more distilleries to go, to complete our passport. 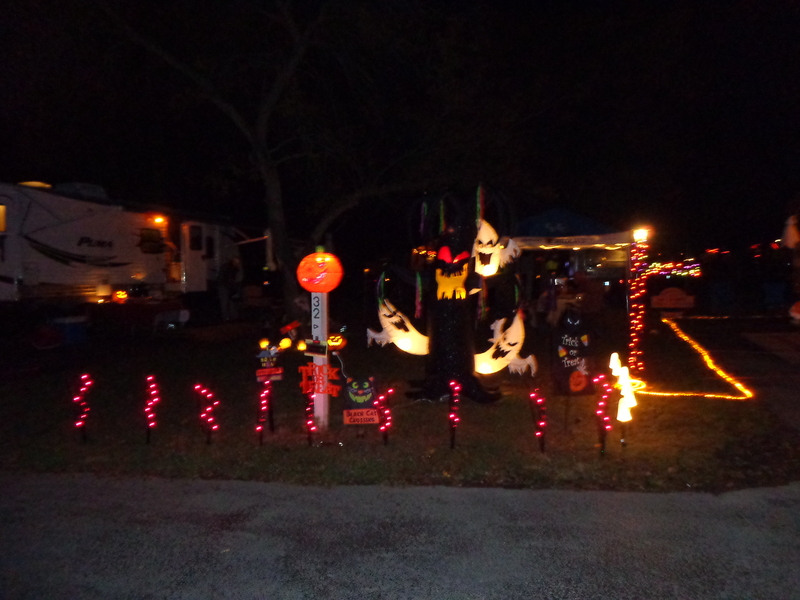 This weekend at the state park was sold out, due to their annual Halloween festivities. I knew it was going to be an interesting weekend when our neighbor came over and asked Dan for help moving his coffins! Friday night they had a folk singer and a storyteller for the kids, plus hot chocolate and a bonfire. 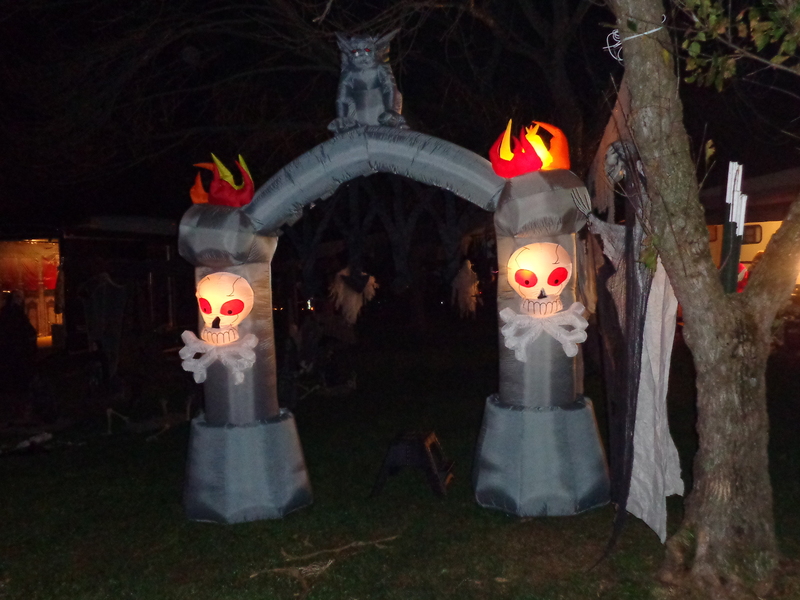 Saturday was the big day for the kids. In the afternoon, they had a lot of games and craft activities. 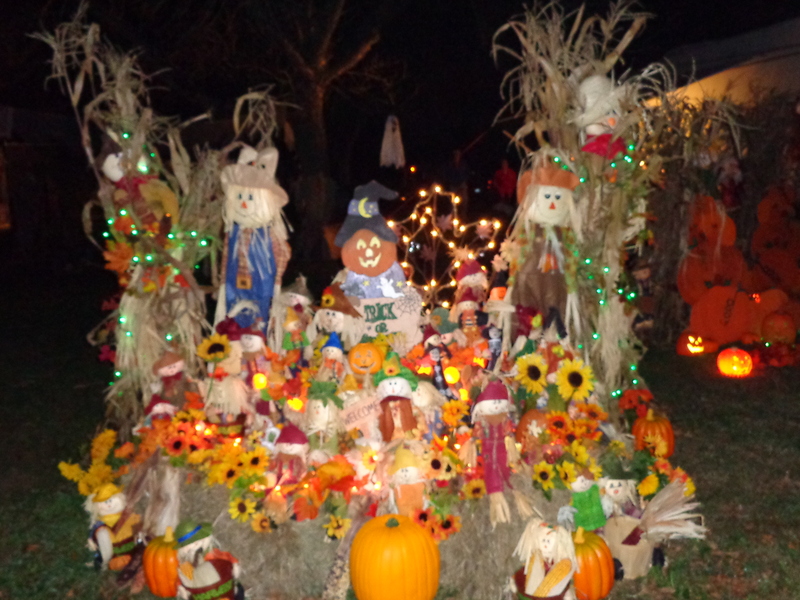 Plus a costume and decorating contest. 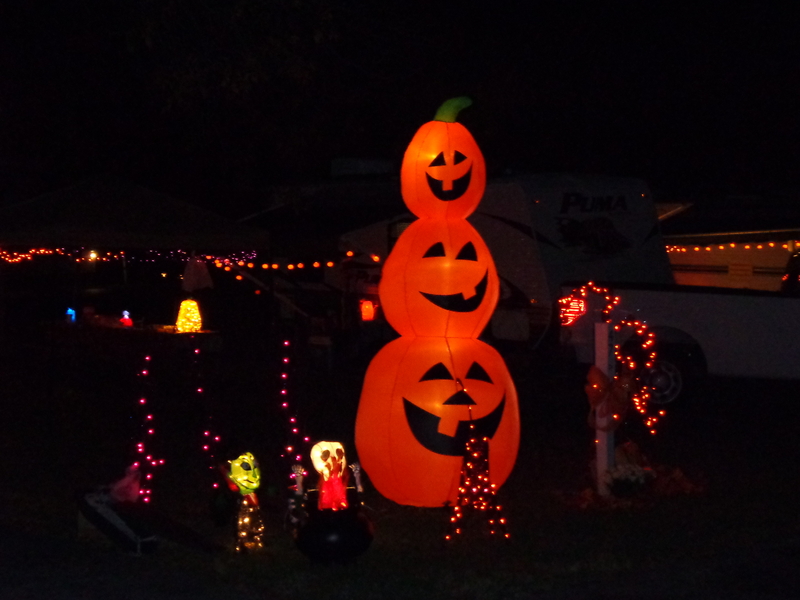 We had to work, but did make it home in time for trick-or-treat. Makena wore her Packers jersey, and received many compliments. 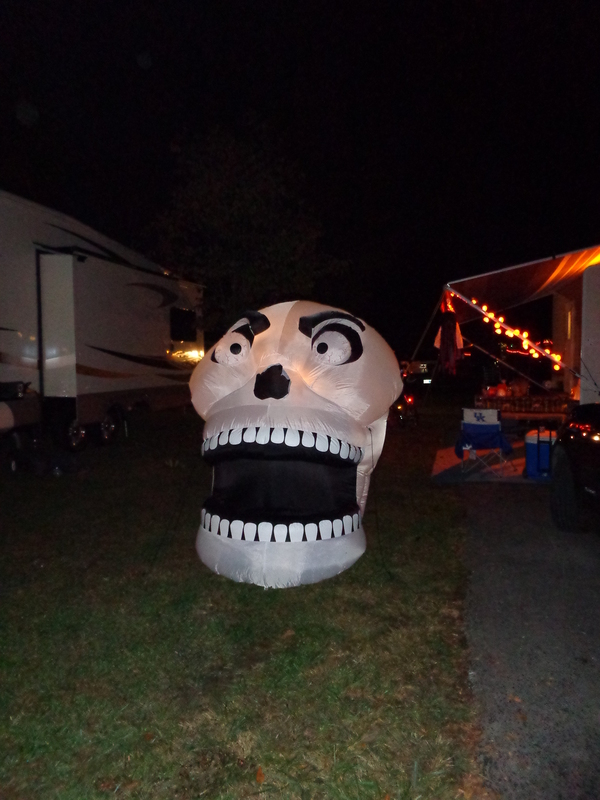 We really didn’t know how much to plan for candy, and we did run out. Duck Hunters seemed to be a popular costume for the boys, and there were two girls that dressed up as I-phones, and they had photos of each other on the corner of the phone (face-time!). 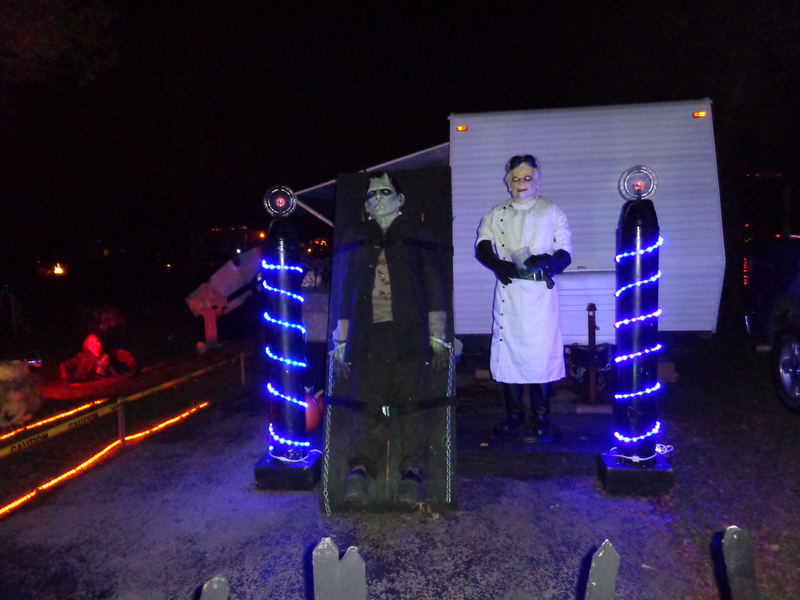 Very creative costumes.